The Boxing Truth®: Can Kovalev Derail Hopkins’ Quest For History? There is little doubt that the Light-Heavyweight unification bout between IBF/WBA Light-Heavyweight champion Bernard Hopkins and undefeated WBO champion Sergey Kovalev has become one of the most anticipated fights in recent years. Of course one might be tempted to say that the term “one of the most anticipated fights” is one that can at times be overused when it comes to the sport of Boxing and combat sports overall. This fight however, the “Anticipation” is certainly warranted. A fight that is not only the next chapter in the Hall of Fame career of Bernard Hopkins, but also the continuation of Hopkins’ quest to duplicate history. Many will remember that as a Middleweight Hopkins not only dominated the division, but would become the first fighter in Boxing history to completely unify the world championships of the WBC, WBA, IBF, and WBO. An impressive feat that was part of what became a historical reign for Hopkins, who set the all-time record for most successful world title defenses in the Middleweight division defending his title an incredible twenty times. Hopkins would also go on to win two separate world titles in the Light-Heavyweight division. What has made Hopkins’ accomplishments even more incredible is the fact that he has accomplished these feats as he has gotten older. At forty-nine years old, Hopkins is not only still active as a fighter, but he sits atop his division at an age where most fighters are retired. Hopkins has made a career of beating the odds. The political landscape of the sport in of itself makes the concept of attempting to completely unify a world championship a difficult task. Hopkins however, has never been one to shy away from odds that most would probably consider steep. Hopkins accomplished the first part of his goal in attempting to becoming an undisputed champion in a second weight class after his IBF world championship win over Tavoris Cloud in March of last year and a mandatory title defense over Karo Murat in October of last year, by defeating WBA champion Beibut Shumenov in April of this year. The next step on Hopkins’ quest comes on Saturday night against the undefeated WBO champion Sergey Kovalev in Atlantic City, New Jersey. Kovalev, who has quickly emerged on the scene as one of the Light-Heavyweight division’s major players has displayed the kind of punching power that is quite similar to that of unified WBA/IBO Middleweight world champion Gennady Golovkin who has also become one of the sport’s hottest rising stars. Much like Golovkin, Kovalev has compiled an impressive string of knockouts stopping ten of his last eleven opponents inside the distance having only his fight with Grover Young declared a tactical draw in August 2011 due to an accidental foul. Much like Golovkin, Kovalev has registered a high career knockout percentage of nearly 89% scoring knockouts in twenty-three of his twenty-six professional fights. Kovalev won his world title by scoring a fourth round knockout over Nathan Cleverly in August of last year. Following his victory over Cleverly, Kovalev would score knockouts in title defenses over Ismayl Sillah, Cedric Agnew, and in August of this year against Blake Caparello. As is the case with Gennady Golovkin, Sergey Kovalev has a seek and destroy style that poses an interesting challenge for any would be opponent. An argument can be made that like Golovkin, Kovalev has not been tested in his career thus far due to his ability to score so many quick knockouts. 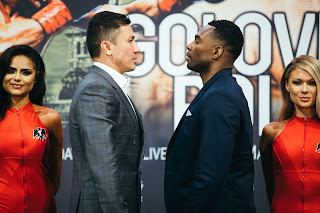 Some critics might also say that neither Golovkin nor Kovalev have faced fighters that most would consider to be on the elite level of their respective divisions. When it comes to the elite fighters of the sport, Bernard Hopkins is as elite as they come. Although this observer has said on many occasions “Anything can happen at any given time in the sport of Boxing and that is what makes our sport great” it is logical to assume especially if one were to use history as a basis that some questions about Sergey Kovalev are likely to be answered in this fight. One should remember after all that Kovalev is facing a fighter in Bernard Hopkins who has beaten fighters throughout his career who established the reputations as knockout artists, most notably Felix Trinidad and Kelly Pavlik. Hopkins has also never been stopped in sixty-five professional fights. As devastating as Kovalev has been in his career thus far and as intimidating as his record appears to be, Hopkins has been in this position before and is likely not intimidated by Kovalev’s statistics. One should also remember however, that each time Bernard Hopkins enters the ring to do battle, he does so not only against the opponent standing across the ring from him, but also against an opponent few fighters have been able to defeat named “Father Time”. Although Hopkins has continued to amaze both Boxing fans and experts alike by continuing to defy father time, one does have to wonder if Hopkins’ age will begin to have an effect on his ability to use his reflexes as well as his ability to take a punch. The key to this fight in my eyes will be whether Sergey Kovalev can accomplish the task that virtually all Bernard Hopkins opponents are charged with. Can Kovalev make Hopkins uncomfortable and unable to dictate the pace of this fight from the outset? There have been some who have been able to have success against Hopkins early in fights, most notably Jermain Taylor and Jean Pascal. Both Taylor and Pascal however, were unable to sustain the quick pace that they were able to put forth early in their fights with Hopkins and thus allowed Hopkins to work his way into those fights as they progressed. It will also be interesting to see how Kovalev will approach Hopkins if he is able to score a knockdown early on in this fight. Hopkins has shown throughout his career that he can get up from the knockdown and turn a fight around in his favor, most notably in his first fight with Jean Pascal where despite suffering knockdowns in the first and third rounds, Hopkins turned the fight in his favor and had won the remainder of the contest in the eyes of many fans and observers in a fight that was ultimately scored a majority draw. The question that will face Bernard Hopkins in this fight is whether he can neutralize Kovalev’s power and whether or not he can set the pace that the fight will be fought. If Kovalev does come out looking to impose his will on Hopkins from the outset, it will be interesting to see whether or not at nearly fifty years of age Hopkins can deal with a fighter of Kovalev’s strength and power. It will be of equal interest however, to see if Kovalev will be able to adapt as this fight progresses. It is worth noting that Kovalev has only been stretched as far as eight rounds only once in his career in his first fight with Darnell Boone in 2010. As devastating as Kovalev has been, he has never faced a fighter with the craft and skill that Bernard Hopkins possesses. If Kovalev is not prepared for a long fight and is going into this fight with the mindset of ending it quickly and is not prepared to combat Hopkins’ veteran tactics, it could play right into Hopkins’ hands. Simply put, unless Sergey Kovalev can end this fight early, he is likely to be tested by one of the masters of the craft that is Boxing and if Kovalev does not have an answer for what Hopkins has in his arsenal, it could be a long evening for him. The fight between Bernard Hopkins and Sergey Kovalev has all the ingredients of what could be a great fight. A living legend and future Hall of Famer looking to add another historical feat to an already historic career going up against an unbeaten knockout artist who is looking to prove that he is the best fighter in the Light-Heavyweight division. Can Kovalev derail Hopkins quest for history or will Hopkins continue to defy the odds? We will find out on Saturday night.